This October, in addition to our annual campaign pushing back on pink ribbon culture and marketing, we marked Breast Cancer Action’s 25th anniversary—25 years of putting women’s health first. I was deeply moved and truly inspired by the energy and commitment of everyone who attended our 25th anniversary event in San Francisco, CA last month. It was humbling to see the BCAction community out in full force—founders’ families, decades-long donors, former Board and staff members, and activists who have been with BCAction since the early days were there. Thank you to everyone who attended and gave so generously, and to those who couldn’t attend but were there in spirit. For those of you who couldn’t join us, be sure watch our new video about our 25 years of activism! “It’s October. And we are once again pushing back on big pink, against hypocrisy, against profiteering off of breast cancer. This year, one of our Community Leaders who is here with us tonight was concerned about a program for cancer patients that’s advertised across the country in hospitals and clinics. In addition to these tips, the program offers free goodie bags full of personal care products and cosmetics donated to cancer patients. For years, we’ve been pushing back on cosmetics companies putting pink ribbons on products containing hormone disruptors, carcinogens, and heavy metals. The cosmetics industry has been a leader in pinkwashing since they put the very first pink ribbons on their toxic cosmetics. In the early 1990s when the creator of the pink ribbon turned down a partnership proposed by Self Magazine and Estee Lauder saying they were “too corporate” for her, the companies did what any good corporation does when someone says ‘no’—they did what they wanted anyway! Their lawyers told them they needed to simply change the color of the ribbon. And focus groups told them that pink was soothing, feminine, and cheerful—as many before me have noted, everything that breast cancer is not. And so peach became pink. And the focus on prevention—the purpose of the original ribbons—shifted to empty awareness. For the Look Good, Feel Better program, the largest trade association for the $70 billion dollar cosmetics and personal care products industry has partnered up with the nation’s largest cancer charity—that’s right, the American Cancer Society comes in at nearly a $Billion dollars in annual revenue. They are working together to give toxic cosmetics to women in cancer treatment. I want to be very clear that we are not telling women they shouldn’t wear make-up. There is no one right way to go through breast cancer. Whether we decide to go through treatment with or without a wig, with or without make-up, with or without prosthesis, it is each woman’s individual choice. However, as an activist organization, we are here to take action when we see a trusted nonprofit giving chemical-laden cosmetics and personal care products to cancer patients. When our members started sending in their Look Good, Feel Better kits, we took a look at what is inside. Each kit is different, and they’re not standardized so you can get anything in there. poly-tetra-flouro-ethylene (PTFE for short)—that’s what most of us know as Teflon. Yes, Teflon is in some of the products our members sent us because Teflon is considered a skin conditioner, and is used to smooth fine lines and wrinkles and ensure a smooth application of the product. Our skin is our largest organ – we don’t want Teflon soaking in through our skin! And the worst part is that many of the cosmetics and personal care products, including those in the Look Good, Feel Better bags, contain hormone disruptors. We know breast cancer is a hormone-driven disease. We know common treatments target the hormone system. Many scientists are concerned about the ways hormone disrupting chemicals in our daily lives can increase our risk of breast cancer. It also turns out that one of the scientists in this room (Dr. Bill Goodson) did important research that found some hormone disruptors—including methylparaben which is in some of the products the ACS is giving to cancer patients–has been shown in a lab to interfere with Tamoxifen, one of the common breast cancer treatments. The ACS and PCPC could take a stand to protect patients and to prevent cancer. They could simply say that any company that wants to be part of the program cannot use harmful chemicals that can increase the risk of breast cancer or interact with treatment. Breast cancer is not pretty, no matter how many pink ribbons get attached—and no matter how many free cosmetics are given to cancer patients. Too many industries and corporations exploit our concern about breast cancer for their profit with promotions that ultimately benefit corporations far more than they help women living with and at risk of breast cancer. This matters, because despite the billions of dollars spent on pink ribbon products, 40,000 women still die of breast cancer each and every year. Within days of launching the campaign I heard from the heads of both organizations wanting to defend the program. And the Personal Care Products Council issued a press release about our campaign. Since they can’t show their products are safe, they basically just slung mud at us. It’s an act of desperation. They are feeling public pressure. We’ve had enormous response from the public and the media. This is how we create change. By raising our voices together. By standing together to push back on corporate power. 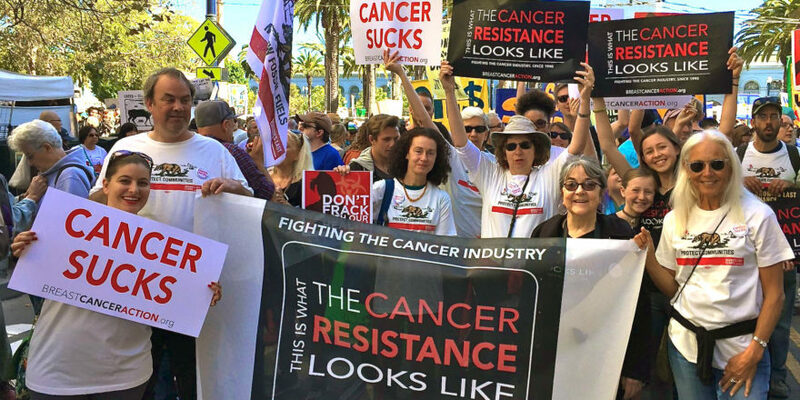 Because no matter how much mud – or dirty corporate money they are willing to throw around – we are stronger. The American Cancer Society simply says that they believe “the benefit outweighs the risk”. Benefit to whom? The cosmetics industry? For 25 years, Breast Cancer Action has put women’s health first to protect patients and prevent cancer. Let there be no doubt. We will always do what it takes to stop women from dying from this disease. We will do what it takes to reduce every woman’s risk of developing this disease in the first place. Social change does not happen quickly. It takes time. And we are in it for the long haul. ← A Powerful Pinktober—Not Stopping Until Our Work Is Done!